This is the ultimate in comedy! One night, six top comics. It's a breathless evening of laughter. As soon as you're done ROFLing over one set, comes some LOLs from the next. It's a glorious celebration of some of the biggest names in comedy, all under one roof... A roof that is constantly in danger of falling down because of all the laughter that ensues. In 2006, Ashish Shakya discarded his freshly-minted engineering degree and became a full-time comedy writer – a favour for which the science community is still grateful. Stand-up followed soon after because the instant approval of strangers was amazing and also pants are optional. As a member of AIB, India’s most well-known comedy collective, Ashish has been part of ambitious projects such as AIB Knockout - India’s first ever comedy roast featuring Bollywood A-listers like Karan Johar, Arjun Kapoor and Ranveer Singh. He’s also co-helmed two seasons of On Air With AIB, an acclaimed news comedy show telecast on primetime TV and Hotstar. His weekly humour column in The Hindustan Times also earned a devoted following during its six-year-run. As a stand-up comic with hundreds of shows under his belt, he has brought the house down in venues across India, Singapore, Dubai, Australia and the UK, and is currently seeking his next big stage thrill. 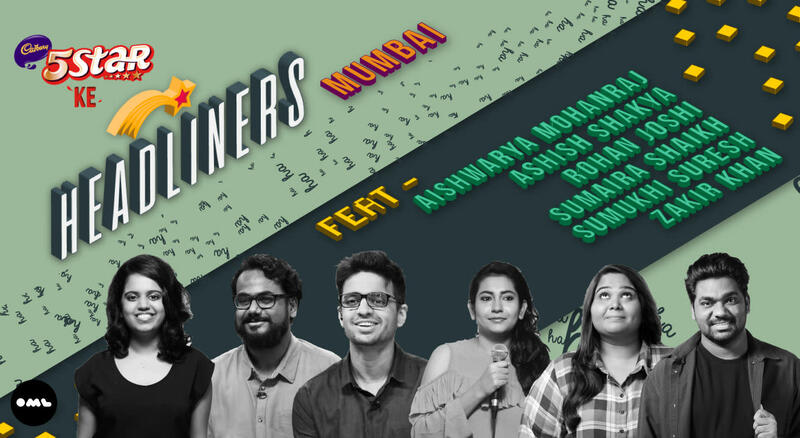 Sumaira Shaikh is a Dongri-bred psychology graduate who gave up being a counsellor and decided to focus all her energies on Stand up comedy and content creation. Along with hitting open mics she has worked with AIB and as a writer on Son of Abish. She then joined Sumukhi Suresh to write Amazon Prime Exclusive- Pushpavalli, HotStar Exclusive- Beauty and the Feast and is currently working on multiple titles with her. She is also script supervisor for Sumukhi's YouTube series Behti Naak. When she isn't writing content or performing she watches wildlife documentaries and takes her mother's fabulous cooking for granted. Sumukhi Suresh is a stand up comedian, writer and actor. She started comedy with Improvisation and thus uses it in all her work. She is known for her character work (read Behti Naak, Parvati Bai, Sumukhi Chawla) and has written a sketch show with Naveen Richard called "Go Straight Take Left". In 2017 she created her first Amazon Prime Exclusive "Pushpavalli" and made sure she will be the creepy friend at all parties. Zakir Khan is one of the the brightest comedians in the country, as proven by the massive success of his recent Haq Se Single tour, and the Amazon Prime special of the same name. Zakir created waves in 2016 with his appearance on AIB Diwas, as he swiftly went on to become what AIB founder Tanmay Bhat describes as “The biggest stand-up comedy act in India. Period”. A writer by profession, this 'Confused Desi' serves his take on modern India, with a hard-to-resist style of humour that'll have you nodding your heads and clapping as you’ll relate to everything he says. One of the few comedians to consistently sell out venues across the country with his hard-to-resist rustic humor, Zakir Khan’s phenomenal rise as one of the most popular comedians in the country is nothing short of extraordinary. Over the last year, he has sold 50,000 tickets with over 100 shows in clubs, colleges and arenas. Called a pioneer of storytelling in Indian comedy, his take on modern India will have you nodding and clapping repeatedly. One of the few comics to India to do stand-up almost entirely in Hindi, Zakir is indeed a unique act, and it's easy to see why. Zakir is currently hopping from one city to another while performing his stand up special called Kaksha Gyarvi. At the same time, he is also featuring on a stand up showcase with fellow comedian Abish Mathew called Special Showcase.